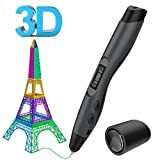 Whether you are an artist, inventor, or would like to experiment with 3D printing, there is a no doubt that desktop 3D printers have made 3D printing far more accessible. There is tons of information online though, and sorting through all of it can be a real hassle. Don’t worry, Comparaboo has you covered! Here is a 3D printer shopping guide to help you decide on the right one for you. Plastic FDM Printers: Filament Deposition Manufacturing (or FDM) printers are the most common consumer models. 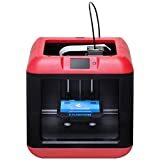 Using plastic filament that is melted and laid onto building surfaces, these entry level 3D printers are easy on the wallet and simple to use. There are two types of plastic FDM Printers: ABS and PLA. ABS prints tougher prints and PLA doesn’t require a heated platform to print. Choosing between the two will be depend on your budget, though some printers can support both. FDM 3D printers: FDM printers that support non plastic materials are able to make prints out of clay, plasticine, or air-cured plastic. They offer users more options as they are able to print a variety of materials. These are ideal for artists and people who want to make clay pots or air dry plasticine crafts for gifts. Stereolithographic (SL) 3D Printers: These advanced printers use resin to print high resolution prints. Designed for company and industrial use, these are fast, high-end printers that are perfect for business owners who are looking for a more efficient machine. 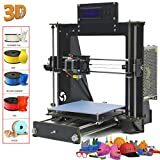 Powder Printing 3D Printers: These 3D printers support a variety of materials such as metal, glass and plastics, and can create custom colored 3D prints. Powder printers are industrial printers that you would find in laboratories and big businesses. Customer Service: 3D printer brands that have good post-sale customer service are praised by their owners. 3D printers are not the run of the mill printers and choosing a quality brand will ensure that diagnostics help and advice is always close on hand. Build Quality: Owners rate build quality very highly and printers without solid, good quality housing are not rated well. 3D printers with good quality and solid builds will ensure more longevity and more prints from your printer. It will also mean the machine is more stable while printing, leading to better quality prints. 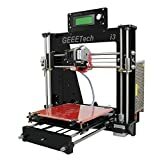 Operation: 3D printers that offer high quality prints and are easy to set up are reviewed much higher. Choosing a printer that can be left to print on their own with minimal user interference and is easy to setup and operate will offer more user satisfaction. 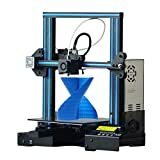 Maintenance: 3D printers that have expensive replacement parts and higher cartridge costs mean greater running costs for the life of the printer. Checking and comparing replacement parts and cartridge costs of the printer and choosing a well known brand before buying will be much easier on your wallet in the long run. Choosing a 3D printer with a LCD screen will offer you simpler navigation, better control and handling of settings, and ensure fast printing. The printer housing is an important consideration when choosing a 3D printer. If you have decided on an ABS FDM 3D printer, good quality housing will help keep your fingers from burning if you have to make adjustments. Heavier frames will ensure less wobbling when printing, which improves printing quality. And plastic and wooden housing frames are ideal for buyers looking for something more portable as they are light enough to move from place to place. The most common FDM printers will use a 1.75 or 3mm filament, but confirming filament size and replacement cartridge costs before hand will help you determine running costs and make sure you never run out while printing. For more printing options with your 3D printer, choose one that offers a heated print platform. A heated platform improves print quality by keeping printed plastic warm and drastically reducing warping. 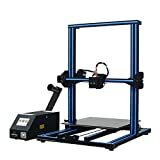 When choosing home 3D printers, you are able to choose them fully assembled or in the form of a kit. Assembled printers are ready to print and save you the hassle of setting up the printer. Kits will give you a better idea about how your printer operates and allow you to make moderations, and are a good way to save money. Your 3D printer should include basic accessories, such as USB cables, a power supply, and maintenance tools for cleaning your printer. Some FDM printers come with basic software, but some have or none at all. 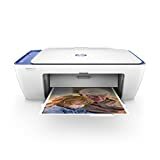 If you are looking for a unit that lets you start printing straight away with minimal hassle, you will find printers with included software more convenient. The XY resolution will determine the amount of detail your 3D printer can produce. The smaller the XY resolution, the more detailed your prints will be. Choosing a printer with an XY resolution of at least 0.01 inches will ensure you are satisfied with the details of your prints. For smoother prints and more color options, choose a FDM printer that offers multiple extruders and can print thinner layers. 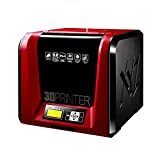 The XYZ dimensions of a 3D printer refers to the maximum size the 3D print can be. 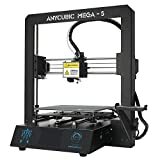 For the most size variety, it is recommended to look for a 3D printer with XYZ measurements of at least 5x5x5 inches. Printing tip: If your 3D printer build platform isn't perfectly flat and level, then you're going to have areas where the plastic that's laid down doesn't sit flat and therefore doesn't adhere to the platform. When this happens, you're likely to end up with your printed object coming unstuck from the platform in places during printing - or even getting pulled off entirely. Buy a good quality brand with quality parts to avoid this problem and ensure printing satisfaction. 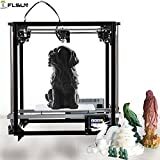 FlashForge: FlashForge is a Chinese 3D Printer company that specializes in the R&D, manufacturing, and selling of desktop 3D printers, 3D scanners, and related materials and filaments. They have sold thousands of printers worldwide, including their award-winning dual-extrusion Creator printer. MakerGear: MakerGear is based in Northeastern Ohio, and has been designing, engineering, and manufacturing desktop 3D printers since 2009. Their M2 printer can print layers even thinner than a single sheet of paper. XYZprinting: A brand new company started in 2013, XYZprinting is already making waves in the world of desktop 3D Printers. XYZprinting is backed by Kinpo Group, which has over $30B in annual revenue, and their first printer, the da Vinci 1.0, won the CES 2014 Editor’s Choice Award.